Green Bean Casserole is a classic, savory side dish that is favored by all! 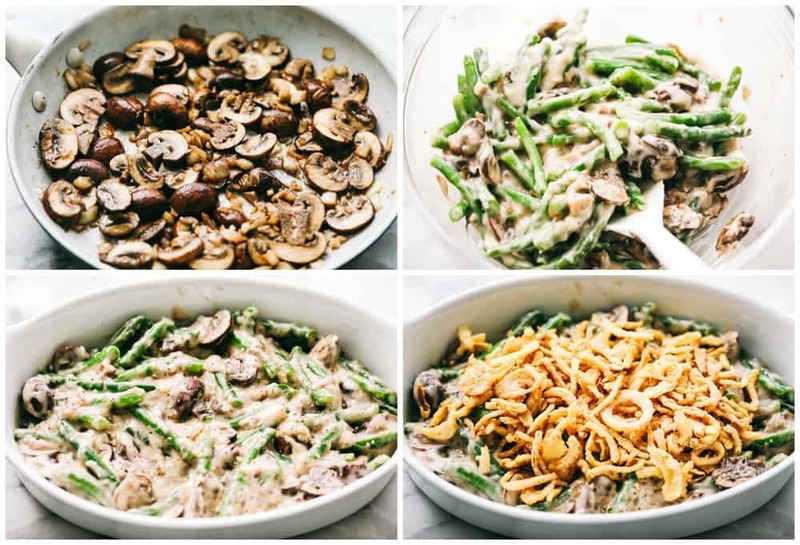 Filled with fresh mushrooms, garlic, parmesan and baked in a creamy sauce, there won’t be a green bean left with this freshly made casserole. This makes for a great side dish paired well with a delicious holiday dinner! Try this Classic Honey Glazed Ham, Garlic Butter Herb Prime Rib, Spiced Rub Brown Sugar Pineapple Glazed Ham, or Slow Cooker Honey Garlic Mustard Glazed Ham. Green Bean Casserole is a holiday side dish must make. I have never been a green bean lover, but I can’t seem to get enough if this creamy side dish. 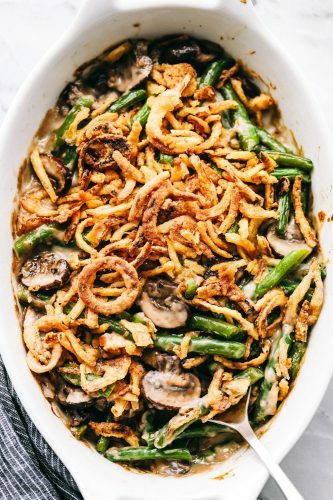 This recipe uses fresh mushrooms salted with onions and garlic which takes this green bean casserole to the next level with amazing flavor. One of my favorite parts of this casserole is topping it with those crisp and tasty onions. This recipe stands apart from all the rest with the fresh green beans, fresh sliced mushrooms, garlic, Parmesan Cheese and crispy onion strings! This dish is always raved about at the holidays at our. dinner table. I know that your family will love it just as much as we do! How Do You Make Green Bean Casserole? Preheat oven to 350 degrees. Melt butter in a large skillet over medium heat. Add onions and mushrooms and cook, stirring occasionally, until just tender. Add garlic and cook another 1-2 minutes, then remove from heat and set aside. Place green beans and chicken broth in a medium saucepan and bring to a boil. Cook about 8 minutes until beans are crisp tender and drain. Spray a 2 quart baking dish with cooking spray. Place the soup, mushroom mixture, green beans, Parmesan, salt, and pepper in a large bowl and stir to combine. Transfer mixture to the prepared baking dish and top with crispy onion strings. Bake at 350 degrees for 20 minutes, until casserole is heated through. Can You Use Canned Green Beans? Okay, so let’s start with the star of the show: the green beans. I cannot even begin to tell you how much of a difference using fresh beans makes! Canned green beans tend to be mushy and tasteless once baked into the casserole, but using fresh beans cooked in chicken broth makes them perfectly crisp-tender and full of flavor! I promise once you use fresh, you will never go back to the can! I just grab a few big handfuls of beans, chop off the ends and cut them in half. You want them in about 1 1/2 inch pieces. 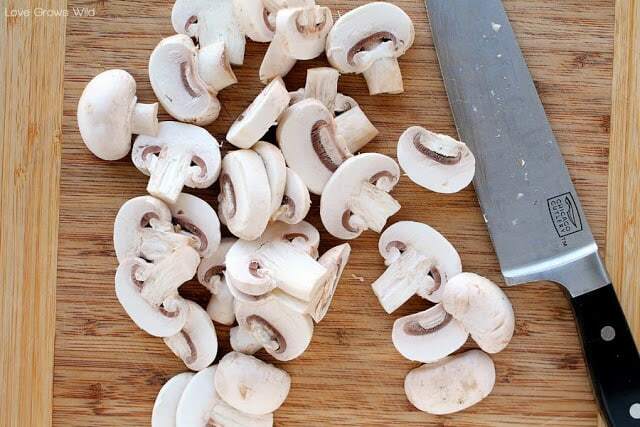 Can You Leave the Mushrooms Out of the Casserole? Now there are very few things that could make this casserole any better, but the addition of fresh mushrooms… perfection! I’m a huge mushroom-lover, but if you’re not a big fan, just go ahead and leave them out. But seriously though… you should leave them in and feel good about doubling your veggie intake for the day. Can You Make Homemade Crispy Fried Onions? 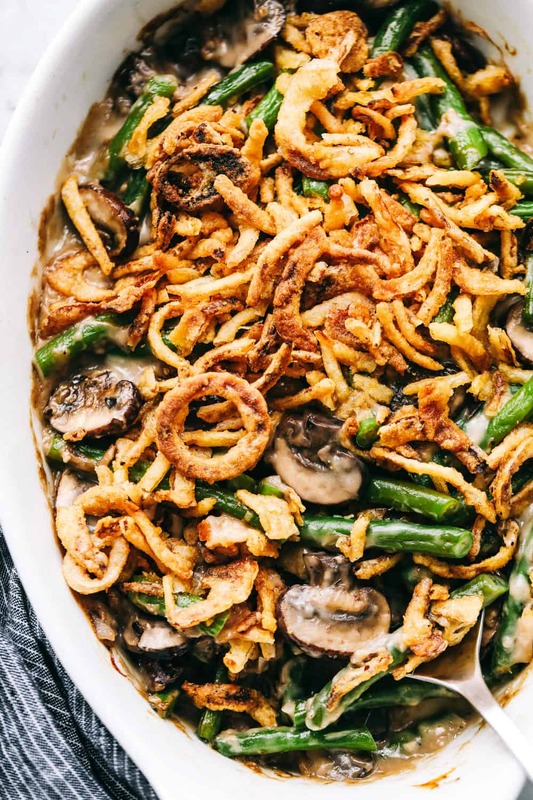 Now green bean casserole just would not be green bean casserole without those yummy little fried onions on top. It’s against Thanksgiving rules. But why buy those onions in a can when you can make your own? I LOVE making homemade crispy onion strings to add to casseroles, hamburgers, salads, and possibly even straight to my mouth. Dipped in ketchup. By the handful. They’re THAT good! Can You Make Green Bean Casserole Ahead of Time? Yes! You can make this casserole 24-48 hours in advance and keep covered in the fridge. Be sure to add the fried onions right before baking. What Can You Substitute the Cream of Mushroom Soup with? Even though I use all kinds of fresh and homemade ingredients in this dish, I still stick with the classic cream of mushroom soup to bind all the ingredients together. Yes, I could make a sauce from scratch (and you totally can! ), but I love using the canned soup as a shortcut and quite frankly I’ll take all the help and shortcuts I can get during the holidays! I really hope you try this awesome side dish at your Thanksgiving meal because I promise you won’t be disappointed! I know I will be chowing down on a big plate of it on turkey day! Need More Vegetable Side Dishes? Look at These! Green Bean Casserole is a classic, savory side dish that is favored by all! Filled with fresh mushrooms, garlic, parmesan and baked in a creamy sauce, there won't be a green bean left with this freshly made casserole. I am Alyssa and the blogger behind The Recipe Critic. I started my blog in June of 2012 as a place to share my passion for cooking. I love trying new things and testing them out with my family. Thanks Jen!! Thanksgiving can’t come soon enough, can it? I just love this yummy recipe! Nice recipe. Thank you, Liz. Happy Halloween! You’re so welcome! Hope you had a wonderful Halloween as well! Liz, how many does this green bean recipe serve? How many servings is this AMAZING recipe? Was also wondering how many servings this is. Trying to figure out how much I need to make for a large family Thanksgiving this week! Thanks, Liz! Can I use anything other than mushroom and mushroom soup as I hate mushrooms?